Not only is there apparently a “father of science fiction” among Taiwanese writers, but the man himself (a professor at the Univ. of Pittsburgh) is nothing short of awe-inspiring. 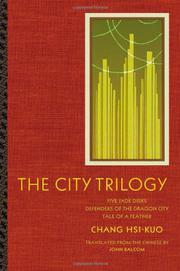 Chang’s trilogy, in English translation for the first time, is set on the world of HuHui, some ridiculous number of years in the future, and is mostly centered on the sprawling metropolis of Sunlon City. Suffused with bad luck since its early history—when human explorers apparently settled the planet—the city has suffered an ungodly amount of tragedy, which continues in the first volume, “Five Jade Disks.” An interstellar empire, the Shan, have conquered the planet, but a rebellion is fomenting. “Defenders of the Dragon City” sets in motion the bloody infighting that could ultimately doom the HuHui people, while “Tale of a Feather” unveils more of the planet’s tragic, ghostly past. The cast of characters is huge, from the battling Green Snake and Leopard brotherhoods (who not unintentionally resemble the warring cults of premodern China) to the imperious but strangely sympathetic Shan, suspicious cult members, and the mysterious, semihuman “native” HuHui Serpent and Leopard peoples, who figure quite dramatically in the trilogy’s frequent battles. Chang’s tone is pitch-perfect from the start, sketching out the mythic outlines of HuHui’s history with magisterial grace while later delivering an action-filled epic that toys with the truly philosophical and all the while infuses the text with a loopy humor. In one instance, a seemingly innocuous conversation about the early bird getting the worm becomes a thorny, surreally logical debate about whether the worm should accept its fate or just get up earlier than the bird. A true original, like an epic of Chinese history retold with Tolkien-esque grandeur and yet wholly unique: a masterpiece.